On the 6th December, I was invited to present my research to the Property Network of the Bristol Junior Chamber. The audience was made up of a range of Bristol housing stakeholders; property and planning lawyers, planning engagement and public-relations consultants, and housing association managers. The presentation covered three areas; the national housing crisis, house building in Bristol, and a prominent finding from my research, the importance and methods of delivering affordable housing in Bristol. Furthermore, local planning authorities must calculate their housing demand based on both the current estimated backlog, and the amount of homes needed in the future for their geographical area. When implementing or reviewing a local plan – the local planning authority’s central planning document for determining planning applications – they must calculate the current backlog of need and expected demand for housing through trend-based projections with various adjustments to calculate the quantity, mix, and size of tenures to meet current and expected demand for the course of the plan’s timeframe (typically reviewed in full or part, every five years). This assessment of housing need is often completed in document entitled as the Strategic Housing Market Assessment (SHMA), and leads to establishing the local authorities Objectively Assessed Need (OAN). Returning to look at housing supply. National housing supply is often front-page news through announcements by government ministers to reach new, and higher, national house-building targets. In 2015, the start of the Conservative Majority Government, then Housing Minister Brandon Lewis set the political target of 1,000,000 by 2020 – averaging out at 200,000 units per year. At a time when national housing completions were recovering from the 2007/08 financial recession, this has failed to materialise with the number of completions last year (2016) remaining below 150,000. Yet, at the end of November last year, Phillip Hammond MP announced in the Autumn Budget to pledge at least £44bn of capital funding, loans, and guarantees to support the housing market and to create the financial incentives necessary to build 300,000 homes a year by the mid-2020s (Hammond, 2017). To put this target into perspective, 300,000 homes a year is equivalent to building the city of Bristol, every nine months. An intention of significant proportions. So how do these political targets relate to building over the past 40 years? DCLG data, which is publically available online and updated quarterly, provides the number of housing starts and completions each quarter since 1978, by each sector – the private-sector, housing associations, and local authorities. The graph below displays the completions over the past 40 years. This data clearly demonstrates a continued and significant decline in housing completion rates since 1978; where the number of dwellings completed was approximately 240,000 dropping to approximately 140,000 in 2016 with a general decline over that period. The figure also predominantly shows the substantial decline of local authority housing production (dark red) which, in 1978, produced almost 100,000 homes; in 2016, local authorities across England produced only 2,090 homes – a 97% reduction in real terms. Housing associations on the other hand (light red), have made a fluctuating contribution to the production of homes. With low-points of less than 10,000 homes in the late 1980s, to peaks of 30,000 by the mid-1990s. Housing associations contributed 17% of all homes produced in 2016, a two-fold increase from 8.5% in 1978, however, this percentage is somewhat misleading. Due to the overall reduction in housing production over this time, in absolute terms, only 3,500 more homes were produced now comparing to 1978. Fundamentally, housing production in England is reliant on the private sector (pink). Over 80% of housing production in 2016 was completed by private-sector enterprise, contributing 114,500 homes. In comparison to the peak housing production level in 1978, the private sector produced slightly more, at 127,500, but this contribution account for only 53% of homes produced. When comparing these current completion rates to national targets, it is clear they fall significantly short of both the 1,000,000 homes target set in 2015 (200,000 units per year until 2020), and Phillip Hammond’s Autumn Budget target of 300,000 annually by the mid-2020s. As such, my research uses this evidence to demonstrate that the housing crisis is fundamentally a result of a national failure to supply enough housing in line with national demand; for nearly forty years the country has not built enough homes. My research builds upon this discussion of the national housing crisis, and focuses on house building in Bristol. The aim of my research is to investigate the relationship between politics and economics within planning law, policy, and practice to explain how these elements interrelate to produce housing in Bristol. For this, I conducted a three-month ethnographic placement with Bristol City Council. The placement was completed in aims to provide an understanding of the local authority’s position to housing production in Bristol, and to perceive its role as the creator and administrator of the statutory local plan, and in its role as the decision-maker in determining planning applications. To examine house building in Bristol, it is first beneficial to examine the Strategic Housing Market Assessments described earlier to clarify the targeted demand for house building. The Wider Bristol SHMA was commissioned by the four West of England local authorities (Bristol City Council, Bath and North East Somerset, North Somerset, and South Gloucester), and produced two reports in 2015. These reports detail the need for housing within the wider Bristol region for 2016-2036. The OAN for the total amount of dwellings in this period, which includes factors such as population growth, concealed and homeless households, and the current backlog of housing provision, is the addition of 85,000 net dwellings across the four local authority areas; an average construction of 4,250 units per year (ORS, 2015: 96). This 85,000 total units includes the OAN for 29,100 affordable units, an average of 1,455 per year. With this demand established, we can once again examine the supply of housing. Firstly, Bristol City Council’s Labour administration, along with the elected Labour executive Mayor, established a political target in their Bristol Labour Manifesto during the local elections in May 2016. The manifesto featured 7 promises to the city, the first of which, was to build 2,000 new homes, of which 800 affordable, a year by 2020. This political target is considered the minimum housing target by the current administration for the length of office. In statutory planning documents, the target supply of housing is laid out in the four authorities Joint Spatial Plan (JSP), the first joint planning approach in the UK which is currently in public consultation. Once adopted (following submission to the Secretary of State in March 2018), the JSP will carry full weight in the planning system, and serve as a higher level strategic planning policy framework. The JSP also triggers a review of each authorities Local Plan to realign with the assessment made across the four authorities. As such, the current draft JSP is indicative of the direction in which house building in Bristol is moving. It identifies the housing targets for the four local authorities as 105,500 net dwellings between 2016-2036; of which, 32,200 are affordable. To examine Bristol city individually, this target is evidenced at 33,500 dwellings by 2036, with a 35% target for affordable units. This raises the question, how do these political and statutory planning targets compare to the current building rates in Bristol. The table below shows the amount of new dwellings built for the financial years 2006-07 to 2016-17. It clearly demonstrates three stages, the pre-financial boom in house building, producing well over 2,000 a year (2006-09); a reduction of house building following the financial crisis (2010-13); and the slow revival of the market to increasingly produce more housing year on year. Source: BCC (2016) Bristol Residential Development Survey Report 2016. If we compare this housing completions data to the political target set by the current Labour administration, we can see that the provisional data for 2016-17 is short only by one completion in providing the number of dwellings. However, the affordable housing provision is considerably short of the 800 homes target. This disparity in affordable housing provision between the political target and completions data exemplifies a key finding from my research; the importance of affordable housing delivery. For Bristol City Council, a key aspect of their role in facilitating housing production, through both plan-making and determining planning application in accordance with local and national planning policies, is encouraging the provision of more affordable housing. Defined in the JSP as “… social rented, affordable rented and intermediate housing provided to households whose needs are not met by the market with regard to local incomes, house prices and rents”, affordable housing delivery is crucial in Bristol due to the higher than national average house prices. The average house price in Bristol has increased from the post-recession low (April 2009) of £153,648 to a current (September 2017) average price of £282,125; this represents an 83% increase. Compared nationally, house prices for the same periods increased from £160,701 to £243,945; a 51% increase. Subsequently, Bristol’s ratio for the median house price to median earnings in 2015 was 7.8; significantly higher than all other English regional cities in the Core Cities Group – Nottingham (4.58), Liverpool (4.68), Manchester (5.14), Birmingham (5.16), Sheffield (5.33), Newcastle (5.63), or Leeds (5.76) (DCLG, 2016: Table 576). As such, the ‘average’ home is increasingly more unaffordable for larger proportions of society. So how is Bristol City Council striving to increase the provision of affordable housing in the city? In support of the political target to produce more affordable housing units as well as market housing, the local authority has allocated a total capital budget of £220 million for housing over the political term. This significant capital budget investment covers a range of approaches to producing more housing. First, increasing ‘traditional’ council house building through a £45 million investment into the local authorities housing delivery team. The first planning application has recently been submitted for 133 units, of which 52 are affordable, on local authority land. This development is Bristol City Council’s largest single housing project since the 1980s. Second, Bristol City Council is currently in the process of establishing its own arms-length, fully-council owned, housing company to accelerate development of larger sites. This is made available through an investment of £104 million by the council to significantly improve the delivery of market and affordable housing, with a focus on the latter through reinvesting profits from developments back into affordable housing delivery. Thirdly, through partnership funding with housing associations to purchase, at cost, affordable housing units on private-sector sites. This £57 million pot, made available over four years, is in attempts to increase the provision of affordable units from private-sector developments, which currently average around 10% per development – despite affordable housing targets of 30% or 40% across the city. The partnership funding grant is already established, and a case study of the Blackberry Hill Hospital site demonstrates its potential success. The site was purchased by the Homes and Communities Agency, and partnered with developers Galliford Try to complete the developments. Upon initial planning application, the viability assessment provided evidence for zero affordable housing units from a total of 305 units. Following reassessment by the developers, this was increased to 20 from 344 units – under 6%. 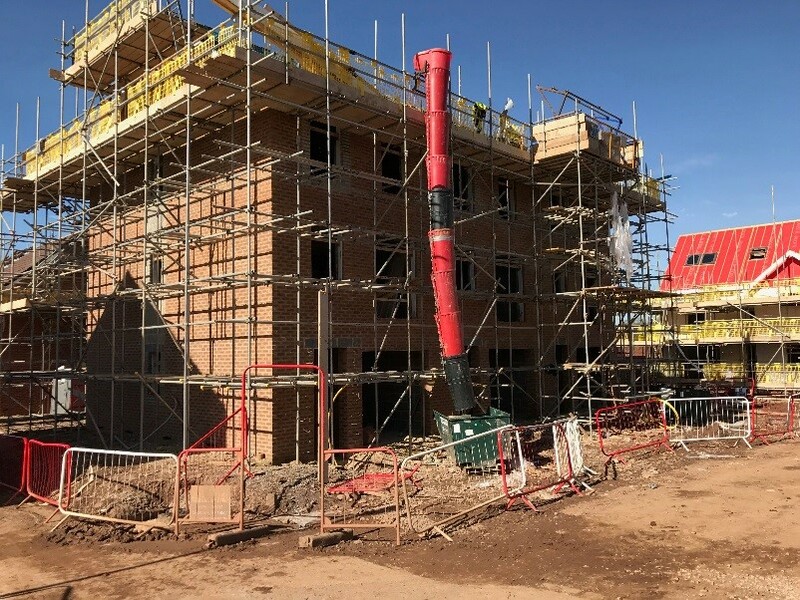 Following the investment by Bristol City Council into the partnership funding, 60 more units will be purchased by housing associations and retained by them for affordable housing provision. Additionally, the Homes and Communities Agency is funding an additional 20 units for shared-ownership, bringing the new total affordable housing provision to 100 units from 344 total; just shy of the policy compliant 30% for the area. In the absence of improvements to the planning system, Bristol City Councils development & partnership contributions are needed to provide the affordable housing the city needs. These three mechanisms which Bristol City Council are implementing are targeting increasing ‘traditional’ council building, a housing delivery company to increase the delivery of market and affordable units through a new approach, and an investment pot to attain increased numbers of affordable housing units from private-sector developments.